A 3-D rendering of the Oumuamua interstellar object. Maybe it's an alien spacecraft. Scientists have been puzzling over Oumuamua ever since the mysterious space object was observed tumbling past the sun in late 2017, NBC News reported. Given its high speed and its unusual trajectory, the reddish, stadium-sized whatever-it-is had clearly come from outside our solar system. 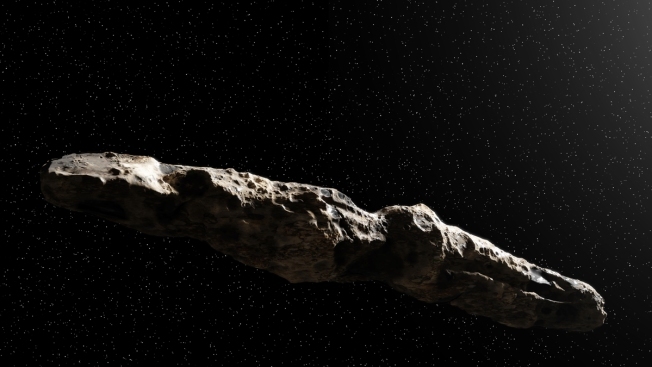 But its flattened, elongated shape and the way it accelerated on its way through the solar system set it apart from conventional asteroids and comets. Now a pair of Harvard researchers are raising the possibility that Oumuamua is an alien spacecraft.